This is happening in KiwiLand for a fundamental reason. The people of New Zealand are NOT “Citizens”. They are SUBJECTS. They are PROPERTY OF THE CROWN and as such have no RIGHTS. They only have the Privileges their Lords and Masters choose to grant to them….and only until said Privileges are revoked. New Zealand….like Britain, Canada, Australia and the rest of the Commonwealth is lost. quite willingly rubberstamp their abuses of power and willful infringement of rights. Fight for them, Die for them and KILL FOR THEM. And until a lot of people in power are killed for abusing our rights and their authority it isn’t going to end. This is how a nation run by leftist SJWs weakens itself even further. Anytime they want it (during a period of global conflict) the Chinese can conquer NZ with two RO/RO ships loaded with APCs. There are some lessons to be learned here, particularly from the wording of confiscation notices and other interactions with authorities. As in the UK, the subjects have been conditioned to obey. Not so here (yet). In the US, when they start trying these tactics in earnest, if they can get over the massive non compliance problem, we will start seeing cops getting shot. I know LEO’s that will simply call in sick that day. When this erupts into a shooting war, John Q. Public has the upper hand, and he will win. So do what the Koran advises when your views are dangerous: employ Taqqiyah and lie about it. Tell the pigs you love the 3rd world Uentermenschen, and you think all of Somalia should move to NZ and live with you. It’s a bad idea to let them know who the resistance is before the balloon goes up. Thought police – Oceania is dead. 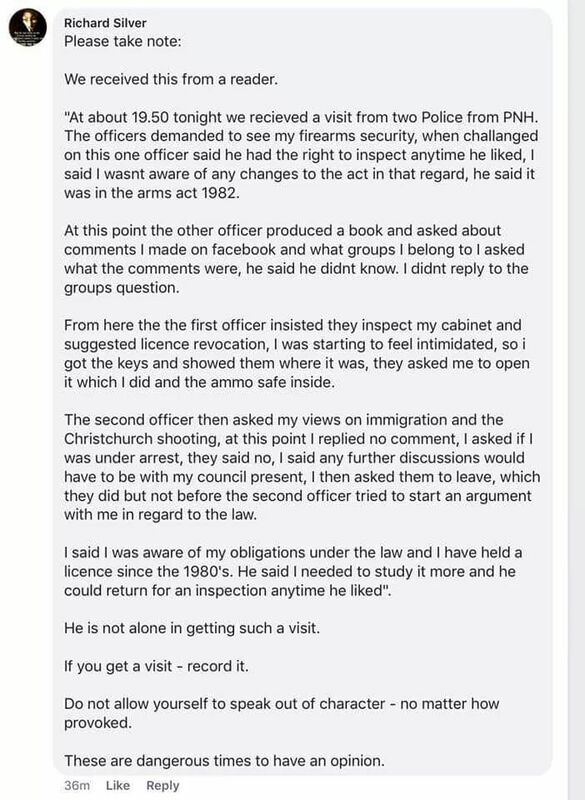 Strange how the police in some countries are eager to play the Staszi role to the hilt. While it might occur in some areas of the US, I doubt the majority of such police departments would embrace such policies with such joy. It is also revealing how free countries like New Zealand are. As for me, lead and silver are wonderful investments. Meanwhile – Behind the curtain: New Scientist 6 April 2019 – People need FORCING to become greener. Politicians will have to consider MAKING people eat less meat and fly [travel] less, because individuals won’t voluntarily change their lifestyles enough to deliver their “fair share” of carbon emission cuts. Only 4% of households would voluntarily give up their car. The result suggests strict government policy is needed to deal with cars, planes and meat-eating … all fervent wishes of the NZ Green coalition ‘partner’ …. as revealed several years ago by a former Party member …. 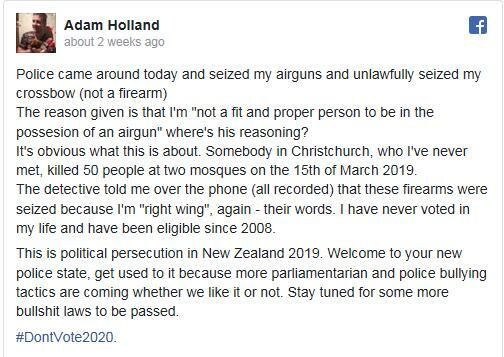 You are currently reading "It Begins: The Police Start To Bully Gun Owners In New Zealand", entry #20934 on The Captain's Journal.